Lots of recipes recommend themselves by promising to be time savers for the cook. 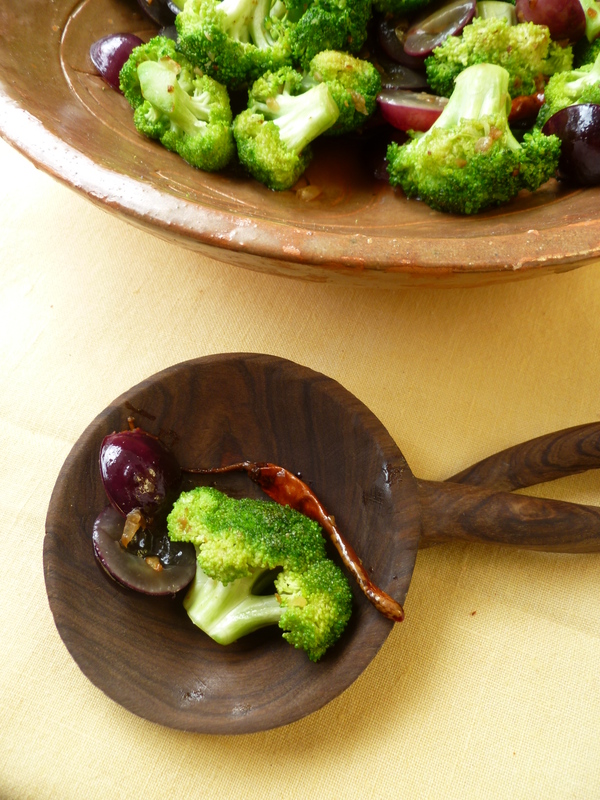 Broccoli and Black Grapes, like a little nursery rhyme, is simple throughout and memorable in the end. It wants little time or effort to make but that is not of the essence when considering whether or not it has something to say for itself in terms of the personal benefits of good cooking. To Whom It May Concern: Because it is crisp, green and fresh, Broccoli and Black Grapes is well chosen to go alongside a rich, savoury autumn dish. Nor will it be overpowered by something highly seasoned, since it has its own pungent bite. With this recipe a cook will turn out something that is easy on the eye and pleasant to the taste. This accomplishment will do her good…and good to those seated around her table. An Invitation: You are invited to request suggestions from the diplomatickitchen for your own menus for any occasion by clicking on the feature ‘Ask and Tell’ here or in the Menu at the top of the page. Replies will be published in ‘Ask and Tell’ or sent by email if you prefer. 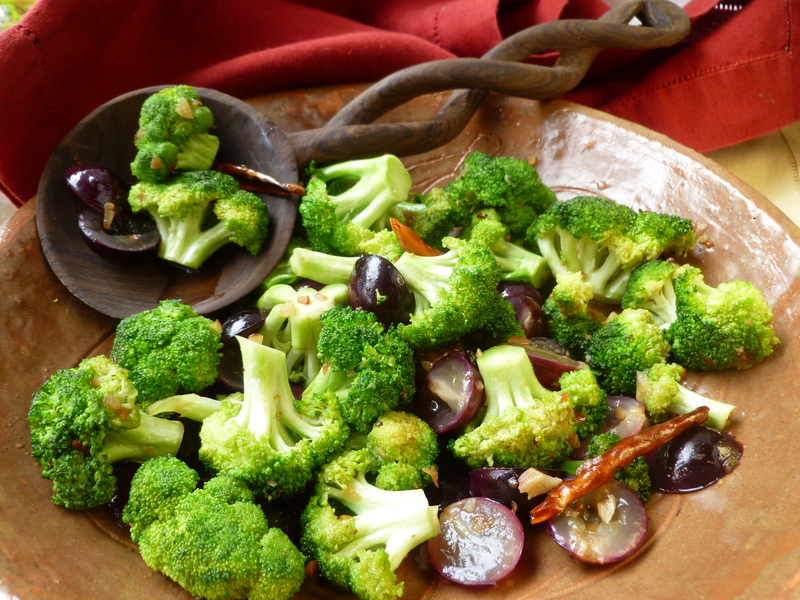 A Timing Note: Broccoli and Black Grapes is ready in minutes and is best when made right before serving it. 2. Heat the olive oil in the pan over medium heat. Add the garlic, the whole chile de árbol peppers, the red chile flakes and the coarse sea salt and sauté, stirring, until the edges of the garlic pieces begin to show some golden color. 3. Add the broccoli flowers and continue to sauté, stirring them about and mixing everything together, for about 2 minutes. 4. Sprinkle the broccoli with the cumin and add the 2 Tablespoons of water. 5. Continue to cook, stirring the broccoli around in the pan, until the water evaporates. 6. 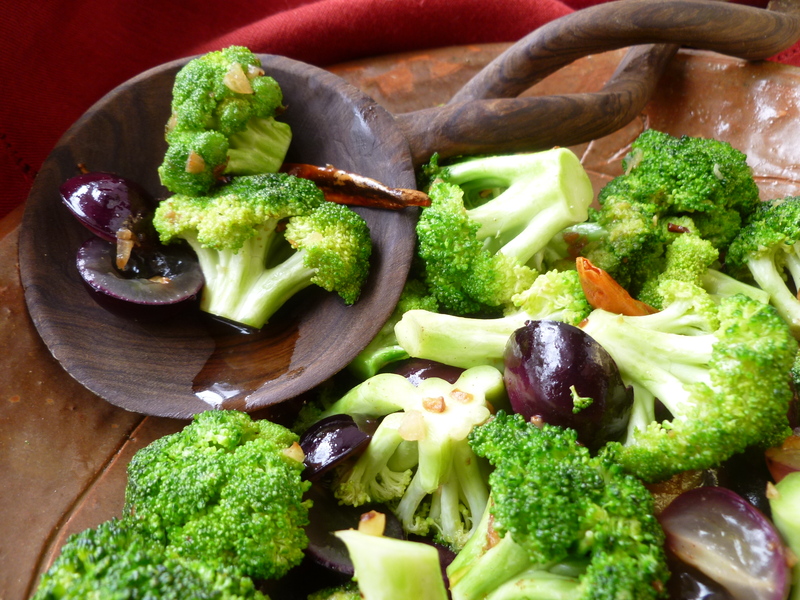 Drizzle the honey over the broccoli, flipping the pieces of vegetable around as you would for a stir-fry. 7. Add the grapes and quickly stir them amongst the flowers of broccoli. 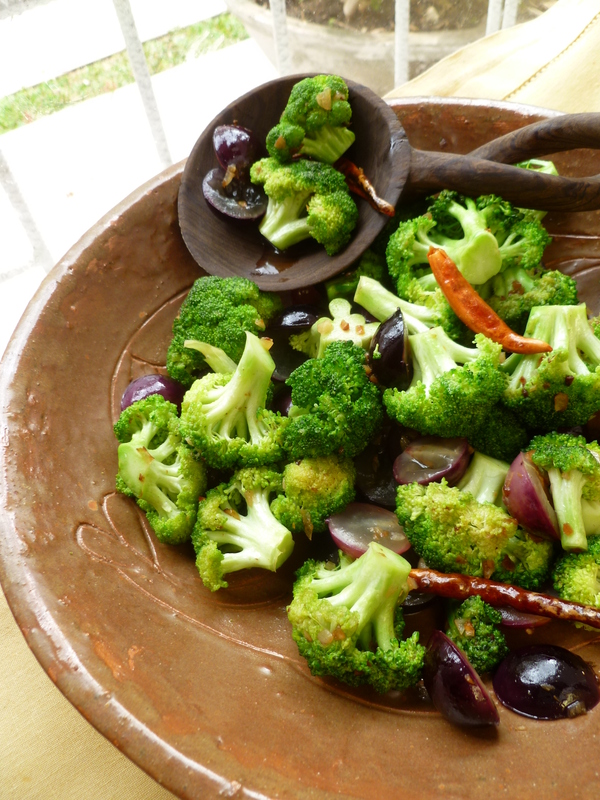 Arrange the Broccoli and Black Grapes on the plates and serve at once. 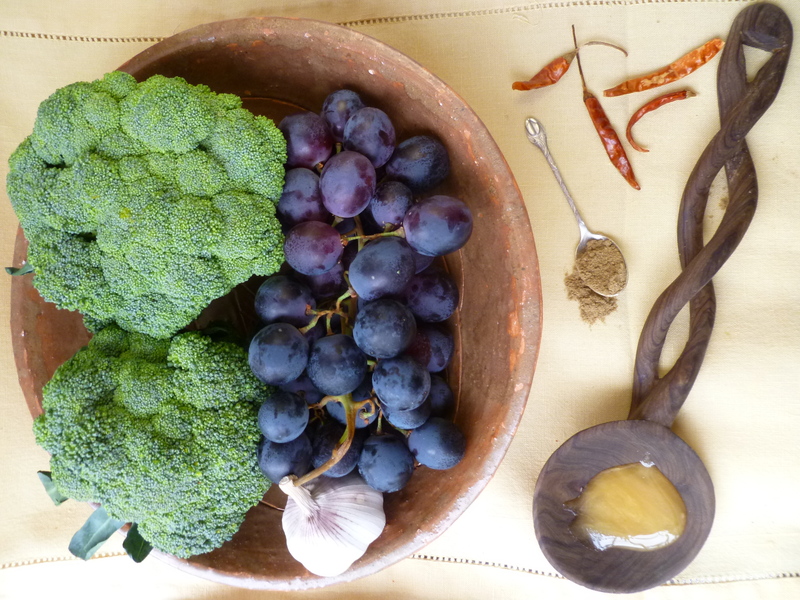 A Note: The idea for Broccoli and Black Grapes was suggested by a recipe adapted by theperfectpantry blog from The Farmer’s Kitchen cookbook (2012). A Last Note: This is a vegetable dish that complements very well the main course of Spicy Roast Quail on Baguette ‘Croûtes’ in the Lunch Menu: Fish and Chicks: a Long, Leisurely Early Autumn Lunch.